A conversation with Willem – A SPECIAL YEAR: THE STUDIO EXISTS 10 YEARS!!!! A very special year indeed! 10 years ago I could not imagine we would make it this far. I didn’t have any tangible future planning at all. But Roger van Doggenaar, now still into zouk and on his own spiritual journey, at that time “forced” me to start my own dance school. He told me to write a business plan. Back then he was into marketing and real estate and he saw golden mountains. He said: :”Willem you are wasting your talent by working freelance for other schools. Let’s set up a business and after a year the dance school was a fact. It’s funny if you write things on paper, a lot of things come true! Some things remain fantasies. The future is a mix of things you plan and surprises. But now you are very rich! Very rich! Unfortunately not in money. The school is of course very stable and doing quite well. The company is a success. The richness comes more from the people I live with, i work with and I teach to. That is very satisfying. On top of that there are the trips to foreign countries where I teach and visit. But only to return happily to my school. So this happened 10 years ago? About 10 years ago. In 2008 I broke up with my girlfriend at that time Debbie, who got me into dancing in the first place. Together we danced in the demonstration team at Dos Bailadores and started teaching there from 2003 on. So I had some experience in performing, with several dance partners and with teaching but not in running my own school. Luckily Leo and Monique hired me as a teacher but also to help managing Dos Bailadores. So I had the opportunity to get some experience while running the business there and I was teaching fulltime since 2008. You built this place, this location and our home here in Overschie, Rotterdam. How did you start? First Roger and I started in the Mirror Centre in Amsterdam. Many dance schools started there. After some disagreements we moved to El Centro, which is now the Brazilian Zouk Amsterdam (BZA) school of Gert Faber and the natural succeeder of that part of the school. I was also doing classes for Salsaventura in The Hague and Rotterdam and Zoetermeer. But when I started my location here in Overschie, that was the signal for Salsaventura to stop the cooperation and there was no way back anymore for me. In the beginning there was a lot of work to be done here and I was keeping the school running in other locations too in Amsterdam and The Hague. I owe a lot of thanks to Leo & Monique from Dos Bailadores. Morry from Salsaventura and Roger who were instrumental for switching from being a dance teacher to having my own school. About three years ago Lorenzo, Marije and Rianne took over that part. Now the Zouk department at Dos Bailadores and BZA are kind of the spin offs of DA Dance Studio. For me, by relinquishing that part, I could focus more on this location. And now the second location in Overschie and the branching out to other dance styles really solidified it as a dance school. Literally we did! We did a lot of work underground to make sure it the floor is one piece and that it can hold the weight. We took out a supporting wall and had to make a whole construction to support the rest of the building. There used to be four doors in total and many small rooms. Now we have three doors: two for the living quarters and one (the old butcher shop) for the school. Was the school always called DA Dance Studio? Actually we started out as Dancalegria, which means ‘the joy of dancing’. But in Holland, people had a lot of difficulty spelling. So once we included solo dances to the curriculum we came to DA Dance Studio. 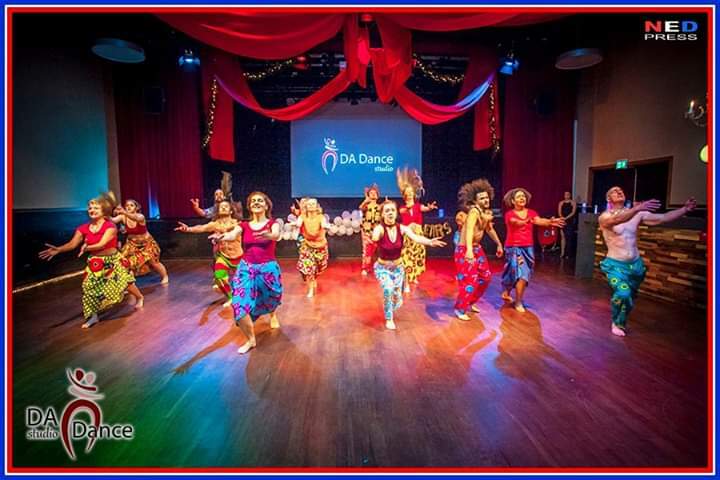 It still stands for Dancalegria Dance Studio , but is more accessible for Dutch and English speaking people and fits the school and it’s students as it is now. What are you most proud of looking back on the last 10 years? Many things in different categories, like the team we built, the students, the tight knit community and that people really feel part of the school. And also that we came from one product (Zouk) and now we are offering 10 different dances, dance holidays and a festival. We offer a lifestyle: people can live their social life in and around the dance school. Culturally or artistically we are able to produce pieces that we perform in the theatre. We do group shows, solo shows and productions. I am proud that we are really about dance as a whole. It is not only about fun. If you want to learn to dance, this is the place to be. And the teacher course adds up to this. If you want to make teaching your job, there is a possibility within this school to do so. If you look in the future, what do you see for the school? I want to keep doing the same, do another Teacher Course. Make sure that the teachers that are teaching here, will keep growing and create their own communities and keeping these communities together. With the expansion of these groups we will be branching out to the dance locations in the surroundings in Overschie. After this summer I will teach a few classes less so I can focus more on the special projects like the Teacher Course, the Embodying Weekends, the Dance Holidays and also working together with Codarts or other government accredited education. In a few years we can offer a bachelor in dance teaching, this is the goal of the school. And for my personal goal: when I have more time, I would like to spend more time on coaching people in making teaching their profession. And maybe create an institution that safeguards the work circumstances of dance professionals, but also safeguard the quality of dance classes and the quality and cultures of dances. It’s a bit like the Wild West now: anybody can call themselves a dance teacher and anyone can claim that their technique is the right one. You can say that as long as you are not hurting anyone, it doesn’t matter. But because of the nature of dancing being physical you can get injured. And the nature of being very connected it can be used as a therapeutic tool but it can also be misused as such. So the quality control should be in place. Wonderful goals. And this whole year we can celebrate??? Yes and we will! We bought 10.000 litres of whiskey, so now it’s mandatory for all students to get drunk first and then dance. Just dance. If you are that drunk you don’t really care what dance it is anymore. When is this event planned so we can prepare…?? But adding to that, the whole year will be a year of celebration but it will also be a year of growth and development for everybody; the students, the teachers, the roommates and of course myself. Thank you dear Willem. Let’s goooooooooo and get ready for the next 10 YEARS of DA!